For too long we have assumed that the latest stage in human evolution is homo economicus: that we are wired to be selfish and competitive at the core and to give priority to the bad in the world over the good. Given this view, several things readily follow. Altruism is an illusion. Aggression and adversarial relations are natural states. Happiness derives from the pursuit of self-interest. This view of human nature has led us astray. What the new, Darwin inspired science of positive emotion is showing is that we are wired to care, to laugh, to forgive, and to be modest. People derive greater happiness spending $20 on someone else than on themselves to indulge some desire. Pleasant touch reduces stress-related physiology and boosts the immune system, as well as individual and social well-being. A bundle of nerves in the chest unique to mammals — the vagus nerve — enables us to connect, to revere, to be inspired, and to appreciate others. New neuroscience suggests when we give to others, or act cooperatively, the nucleus accumbens, a region of the brain known to have many dopamine receptors and to process rewards, lights up. New discoveries are finding that oxytocin, a neuropeptide that floats through the bloodstream, promotes trust and devotion. Modest expressions of gratitude, the simple "thank you," smile, or warm gaze, prompts the recipient of such kindness to be kind in ensuing interactions. Even in economic games between strangers, cooperators and those who forgive their partner's more selfish behaviors fare better than competitors in terms of economic outcome. Survival of the kindest may be a more apt description of human nature rather than survival of the most selfish. Happiness may be closer than you think, and can be found in the cultivation of the emotions that evolution has shaped in this most caring and playful of species. We have been misled by Machiavellian notions of power, that power is based in deception, strategic manipulation, and leading through fear rather than respect and kindness. The new science of power reveals instead, that power is rooted in the ability for people to advance the interests of the greater good. It is given to others who bring people together and build strong social networks rather than grabbed by the power hungry. The experience of power, though, diminishes our capacities for social intelligence, making people more likely to act impulsively and suffer empathy failures in their exchanges with others. Given this paradox — that people acquire power through socially intelligent practices, but lose those talents once feeling the surges of power — there is a strong need for the cultivation of social intelligence. This is done in the micro-interactions that build up liking, trust, respect, strength, credibility, and openness. 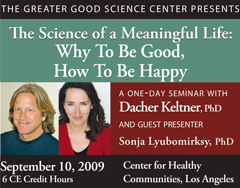 The new science of happiness suggests that the ancient ways of knowing were onto something: that through the right cultivation of mindful practices, we can find greater happiness and promote the happiness of others (Jen in Confucianist thought). The need for cultivating these practices is greater than ever: numerous studies suggest that our marriages are less happy than they should be, our children (US) are some of the least happy in the industrialized world, our communities are less trusting, and we, as individuals, endowed with the right to pursue happiness, are not faring well in this endeavor. Happiness and health are found in practices that diminish the toxic effects of stress — social contact, laughter, nature, meditation, physical exertion. Happiness and health are found on a second pathway as well, the cultivation of the emotions that enable us to bring out the good in others — reverence, compassion, gratitude, awe, love, and modesty.